LOCATED IN TOOWOOMBA, QLD, AUSTRALIA. In 1966 a domestic cat gave birth to a hairless kitten in Toronto, Canada. It was discovered to be a natural mutation and the Sphynx cat, as we know it today, came into existence. This cat and a few other naturally hairless cats have been found worldwide. These have magically been produced by Mother Nature and are the foundation for this unusual breed. Cat breeders in Europe and North America have bred the Sphynx to normal coated cats and then back to hairless for more than thirty years. The purpose of these selective breedings was to create a genetically sound cat with a large gene pool and hybrid vigor. This is a very robust breed with few health or genetic problems. The Sphynx is not always totally hairless; there can be a fine down on the body, which makes the cat feel like a warm peach. Some light hair is often present on the nose, tail and toes. The texture of the Sphynx skin has been likened to suede, a hot water bottle, or a heated chamois. They can be registered in a wide variety of cat colors. The color is seen in the pigment of the skin and the few hairs that they do have. One of the questions most asked is "Don't they get cold?" Well, of course, if it is too cold for you it will be too cold for a hairless cat too. However, these cats are smart enough to find a warm human, dog or cat to curl up with or they will get under your bed covers. This is a substantial cat, medium sized and strong, with adult males being larger than adult females. Sphynx have sturdy boning and good muscle development and should have a bit of a belly as if they just finished dinner. They have an open-eyed, intelligent face and a friendly expression. The Sphynx are extremely inquisitive and love to be the center of attention. They perform silly antics for your entertainment and are sometimes downright clumsy…on purpose it seems. They make great show cats because of this "look at me" attitude and they are easy for judges to handle. They prefer human attention but enjoy the company of dogs and other cats. They have an abundance of energy and mischief and are always with you, on you or showing off for you. "Love Mooch" is the perfect term for these amazing cats. Because of the lack of hair that would normally absorb body oils, the Sphynx needs to be bathed periodically. Some people who suffer from cat allergies can tolerate living with Sphynx cats. However, depending on the type and severity of the individual's allergic reactions, there are still people who cannot live with this breed. Sphynx lovers feel this is one of the most rare and unusual breeds in the cat fancy today…Sphynx are pure enchantment. Credit given to Pat and Dalton Sales of Dalpat for this summary. Manis Alvie from our first sphynx litter is now residing in Sydney with Elizabeth and her family. He is a red and white. To the uninitiated, they are ugly yet intriguing. Looking like something out of this world, the shock of seeing them for the first time givesway to pleasure and fascination. The first touch is often met with apprehension. The second addictive. They feel like the finest silk, smooth and warm to the touch. Find the key, engage the clutch, slip into gear and listen to the motor run. These babies can purr better than the rest of them. They sound like a finely tuned drag car. Expressive eyes that look into your soul, once they give you their love,you get their utter devotion. Trailing you everywhere in the house, never wanting to be alone. If you sit down, they are on your lap and love to be the centre of attention with their playful antics. 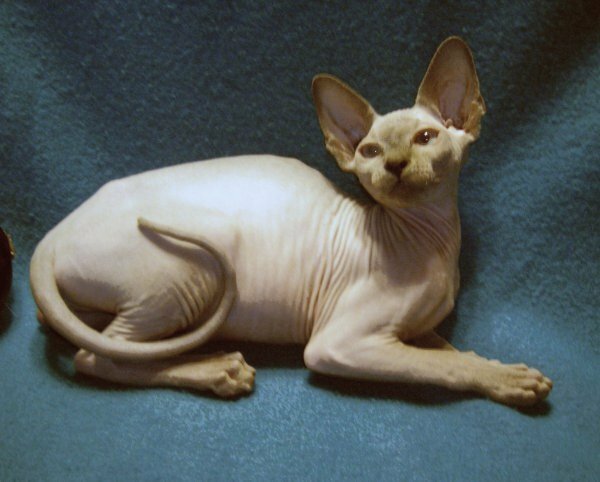 With minimum maintenance, a bath every three weeks, ears cleaned weekly, nails clipped as required, the sphynx do not require oiling as they are naturally bald and are not like the Chinese crested which are shaved. If you have an allergy to cat hair, this is the breed for you. Mischievious and playful, you have to watch them. They like to steal keys and knicknacks, be careful they don't steal your heart or else you'll be sphynxed for life. All pictures and narrative copyrighted by Manis Cattery.